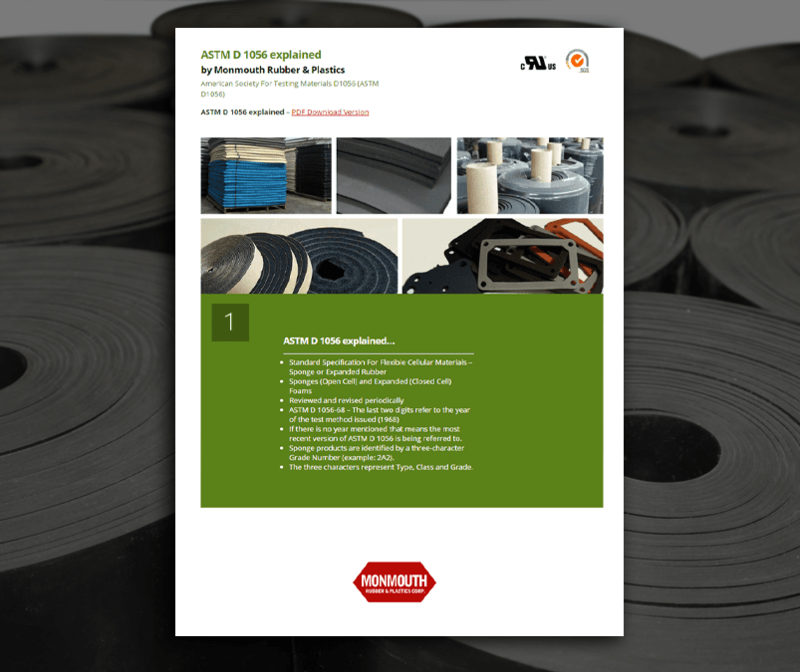 The American Society of Testing Materials prepared the ASTM D 1056 specifications to “cover flexible cellular rubber products known as sponge rubber and expanded rubber. The base material for an open/closed cellular product may be made of synthetic, reclaimed or natural rubber, or a mixture, and may contain other polymers or chemicals, or both, which may be modified by organic or inorganic additives”. “ASTM D 1056 explained” by Monmouth Rubber & Plastics is a free download at their website https://monmouthrubber.com/astm-d-1056-explained-by-monmouth-rubber-plastics/. Monmouth Rubber & Plastics has been the number one choice around the world for rubber and plastic manufacturing, with a rich history of quality products and outstanding service. “For 52 years, Monmouth Rubber & Plastics Corp. has been a leader in the innovation and technology of cellular polymeric materials. As a recognized leader and innovator of proprietary closed cell cross linking technology and polymer blend technology, Monmouth was retained to do product improvement by a variety of companies” said President and COO, John Bonforte Jr.
For more information about Monmouth Rubber and Plastics Corp., and free tech support, contact John Bonforte Sr. at johnsr@monmouthrubber.com or 732-229-3444 x12.